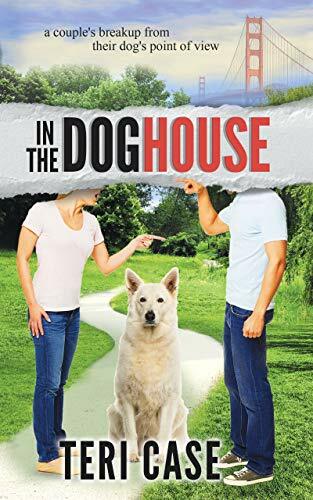 IN THE DOGHOUSE is loaded with what I expect from author, Teri Case–heart and hope. But DOGHOUSE contains a lot of humor too. Skip, a rescued Wolador (a wolf-lab mix), reacts to the breakup of his pack with his own brand of well-articulated dog logic. He feels sad and lonely and worries that he is to blame for the breakup of John and Lucy. Darn that Bunny, anyway. While a couple’s undoing after ten years together is naturally fraught with emotion, telling the story from poor Skip’s point of view—along with his efforts to help Lucy cope–make it particularly sweet and poignant. Remember, a dog lives in the bow-now. When Lucy finally stops crying, she decides to move forward and not go under. She and Skip step outside their comfort zone and get to know a few new people, together. Lucy starts a rewarding new job at an assisted living center. She and Skip connect with colorful, well-drawn neighbors in their building, including the mysterious but handsome hoarder next door and a young Harry Potter fan who also happens to be on the autism spectrum. She and Skip attend doga (dog yoga) classes. Slowly–and by fits and starts–they build a new and much larger pack. Lucy changes, becomes a new and improved version of herself. Does she really want John back now? Skip’s not so sure that’s a good idea. After reading two heavy, sad, dark novels peopled by dysfunctional families with abused and neglected children (you know, typical literary fiction fare) I was in need of a palate cleanser. IN THE DOGHOUSE was the perfect antidote. Sure, there is some grief and loss, but also so much light and love. And if you are a dog person—or know one—I can’t recommend this feel-good book enough.